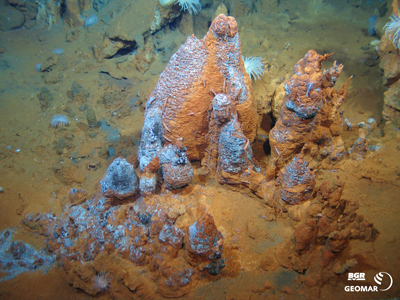 Seafloor massive sulfides are deposits of metal-bearing minerals that form on and below the seabed as a result of heated seawater interacting with oceanic crust. These occurrences are more variable than previously thought, and this variability is not necessarily reflected in the analogous volcanogenic massive sulfide deposits that are preserved in the ancient rock record. The geological differences affect both the geochemistry and the size of seafloor massive sulfide deposits. Current knowledge of the distribution, tonnage, and grade of seafloor massive sulfides is inadequate to rigorously assess their global resource potential due to the limitations in exploration and assessment technologies and to our current understanding of their 3-D characteristics.